They still do (especially the estate agents). Though, to be fair, this was when Clapham Mutts – the fair’s annual dog show – was taking place in the arena just behind our stall. Also, to be fair, I hadn’t ought to criticise estate agents this morning, having enjoyed Dexters’* light-as-air cup cakes at no charge on Saturday afternoon. It wasn’t just Dexters offering free comestibles, a gentleman wearing a chef’s coat was seen carrying large trays of what looked like delectable nibbles around, which didn’t last long. I didn’t get to try any, but folk who did seemed to like them. Nor do I know from whence the man came, lots of local restaurants were taking part. Clapham is a good place to live (though it has become unaffordable for many, I appreciate) and events like this one demonstrate why. The sun was shining and it was hot in the open, landscaped space in the Georgian Old Town, adjacent to the Common. There were plenty of families, but couples, groups of friends and individuals too, out to enjoy the food and drink, the music and the activities. This was the third September shindig and the Festival has taken part in all of them ( see At The Polygon and He Shouldn’t have Parked There for reports on earlier events ). The event is arranged by This is Clapham – the estimable Jeremy Keates, its’ elected officer, was in evidence taking photos during the day – in partnership with Omnibus Theatre. It continues to thrive and grow and has a good, community feel, with lots of local societies taking part. Charitable bodies, like our own, are permitted free stalls, a noted difference from other Fetes and fiestas. This year the event spread from The Polygon into nearby Omnibus Theatre, where a Local History Fair took over that space, as part of the month-long Lambeth Heritage Festival. Inside there were stands from the Cinema Museum, from Lambeth Palace Library and the Clapham, Brixton and Streatham Societies with historical displays and books for sale. I didn’t see them – too busy on our own stall – but there were talks in the theatre, including one about the history of Clapham Library and its conversion to Omnibus Theatre, and guided local walks. The Clapham Literary Trail free leaflets on our stall had plenty of takers. We gathered lots more e-mail addresses from people interested in being informed about the Festival and a few people came along who had been to this year’s edition. One of them, David, the winner of this year’s Prize Draw, dropped by to say hello – and buy a book. In all we sold well over a hundred books, all donated by local authors and publishers, and raised several hundred pounds for the Festival, as well as its profile. ‘Oh I can’t buy any books. I’ve got far too many already,’ was a common refrain, though I must say that every single person who said this ( bar one, who was on a bike ) went on to buy at least one book. Some bought four or five. Others asked us to put some volumes aside while they went off to get cash and then returned to purchase their books. But these were bargains and if you’re a book person, well, you can’t walk away from good books at bargain prices. My one gripe – I missed the Penalty Shoot-out. *For those who don’t know, Dexters is an estate agents and one of the sponsors of the Old Town Fair. A version of this article appeared on The Story Bazaar web-site earlier the same day. The final, happy action from 2018’s Clapham Book Festival was to draw the name of the lucky winner of our prize raffle. Many of the management committee gathered, most appropriately, at The Windmill on the Common last Wednesday evening to do this very thing. 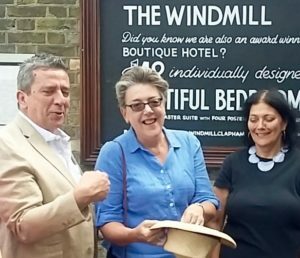 The draw was made by Ben Evans, General Manager of The Windmill, as the star prize was an overnight stay for two with breakfast at said Windmill, the boutique hotel in the old coaching inn on Clapham Common which, some claim, is the inn at which Lydia and Wickham from Pride and Prejudice were last sighted as they took a hansom cab into London. The winner, Mr David Cambridge, is a resident of Clapham and it was his first visit to the Clapham Book Festival where he attended Walls Have Ears, with Clare Mulley, Henry Hemming and Simon Berthon. He said that he enjoyed it and will definitely be back next year. It wasn’t all fun and larks on Wednesday, though it was very enjoyable, as we hadn’t met since the end of May. We also had a full Board meeting, discussing the comprehensive due diligence exercise that needs to be undertaken in the late Summer/Autumn to prepare for next year’s Festival, which is likely to take place in the Autumn. This means reviewing all our options as regards venue or venues, how we sell books, what our marketing strategy should be, as well as how we reach out to the local community. As part of this exercise we have been speaking with the organiser of Balham Literary Festival, (and owner of Dulwich Books) which also takes place in south London in Spring. There’s also lots of learning to be had from other literary festivals in the London area. That will be happening later in the year, but the search for sponsorship and funding continues year round and two of our number are already determining their strategy to approach Clapham businesses. I, meanwhile, will be drafting a bid for funds from our local authority (hot on the heels of appearing at their Country Show, see photo, left, of The History Girls event). We will all be searching for other funding opportunities, including approaching some national companies with an offer for them to be single major sponsors. It really is a fallacy that organising an event like a book festival isn’t an all-year-round job, because it is! In the meantime, up-coming Clapham Writers events include a book stall at Clapham Fete on 1st September and a visit to Brixton jail later that month. We’ll also be checking out how we might bring the Festival, or elements of it, to people who would like to go, but cannot get to it, e.g. in a local hospice. The outreach work also continues. A version of this article appeared on The Story Bazaar on 6th August 2018. So, are women better at writing thriller/crime novels than men? The consensus on Saturday’s panel at the Clapham Book festival events at the Lambeth Country Show was that there isn’t a gender difference, both can be excellent, though there often is a gender difference reflected in the subject matter and style of thriller/crime writers. As Isabelle Grey said, women tend to be more attuned to the possibilities of violence and the telling details, because their life experience is such that the shadow at the end of the path might be a real threat to the lone woman walker, the knowledge that the initially friendly but somewhat too persistent ‘admirer’ could turn ugly. And, of course, the likelihood of being the victim of domestic violence is so much higher ( see the recent long term Lancaster University study which shows regular increases in domestic assaults on women during World Cup tournaments ). Just one of the subjects raised in Thriller in the Park, a really excellent discussion and one which flowed because the participants were interested in it ( always the best kind for a moderator ). Then a fifteen minute break in which books were sold – one woman was so pleased to have a copy signed by its author that she took a selfie with her too. On to a reprise of Place & the Writer, a discussion at the 2016 Book Fest, this time without Matthew Beaumont, but covering the same ground. Militant pedestrianism was a popular discussion point in relation to Clapham Common, but then it was also topical – this was the first Lambeth Country Show in 43 years which was enclosed, with a strong security presence and bag checks on entry. Our security was provided by Jordan of whom I have already written (see Sunshine at Lambeth Country Show). The Sunday session was similarly successful, when our audience was somewhat larger, mainly, we thought, because people knew we were there having seen us the day before. (The organisers really need to get their announcements system sorted.) In addition, the TV profile of Prof Kate Williams would have helped. So we had a reasonably full tent when we began by asking our audience which were their favourite historical novelists. Georgette Heyer, Lady Antonia Fraser, Hilary Mantel… all women. The discussion ranged over why we write historical fiction, the differences between writing history and historical fiction and the seductive power of research. There was a super question from an enthusiastic ten year old, asking us if we sided with any of our characters against the others and lots of good chat with the audience. Books were signed and sold and folk asked about the Festival (almost no one we met knew it existed, testament to the insularity of the little communities which are scattered across south London ). Its profile was definitely raised and we gathered more followers on social media. 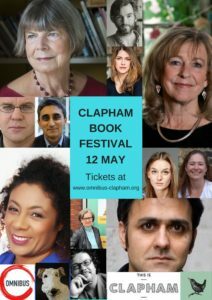 The official photographs and video aren’t yet available, but they will be posted on the Book Fest site and that of Clapham Writers when they are. Then we packed up to the strains of reggae – the next speaker was Dennis Bovell, legendary reggae musician and film maker. Sunday in the Park with Books was coming to an end. And the next outing for Clapham Book Festival, well it could be Clapham Village Fete on 1st September or a visit to gaol. Saturday morning is hot and sunny in south London. Eleven o’clock sees us on our way to Brockwell Park, having collected, inventoried and packed up the books the day before. Already the roads are busy and we were headed for Gate 2, traders and performers only. Yikes! The road to Gate 2 is closed. What do we do now? Ah, but there’s a man in a high viz jacket holding a clipboard, maybe the road is only closed to everyday traffic? We are in possession of a parking access permit to the Show Ground, perhaps this magic piece of paper is our passport through. And it is. We turn into the road and through the gate, shepherded along by yellow clad stewards, who all, curiously, have Scottish accents. But the twang in the voice of the parking lady is decidedly antipodean as we are directed to our parking space. So far so good. Now we just have to transport the books, using the trolley from the bookshop ( a hooray for Herne Hill Books ) to our stand in the Discovery Zone. But this is a big park and the Show Ground is fenced off behind high green metal walls, so we can’t see in. Plus, the dry grassy ground is uneven and the boxes of books tend to slide sideways off the trolley if there is a camber to the ground. Cue stress. Head for the nearest asphalt path. The trolley’s boxes only slide off twice before we make it. Then it’s up the hill to a pair of forbidding-looking heavy metal gates. We drag them open and we’re through, into the Show Ground proper. There we are taken pity on by another yellow-clad Scot, Mick from Glasgow, who, like us, is ignorant of the Discovery Zone’s location but, grasping both trolley and heavy bag proceeds up the hill to Brockwell House, where his colleagues are able to direct him. So, past the big open space which will become the Main Arena later, alongside the backs of a series of food and drink outlets and there, in the distance, is the big Discovery banner. And some Clapham Book Fest folk are already there! Sitting at a picnic table. Greetings all round. But we are puzzled – we know that our sessions will take place in a marquee, but there are three marquees in a line, which is ours? One is already occupied by a number of scientific and medical societies, so that’s out. One has a half closed front, so surely that’s not ours. No, we decide it’s the middle one, which has a low stage and a sound man in the corner, testing his equipment. As yet there are no seats and no tables for selling books. But we have a security man – Jordan from Glasgow explains that the Security firm hired for the event is from Scotland, they all came down the night before. He’s very helpful – ‘Dunna pay full price,’ he yells after me as I go to buy ice creams. ‘Tell him you’re staff – it’s £2. Have ye seen what they charge for a cone round here?’ Mr Whippy duly obliges. Mitchell, the sound man, knows nothing about any furniture, but, he says the stage is not yet safe, we must wait for his colleague to come and fix it. We are on at one. It’s already twelve. ‘Oh, you’ve got a whole hour. No worries.’ He says. But we are worrying. I head off to find someone in charge – there’s supposed to be an events manager called Chris. I find him and he tells me that 200 chairs have been requested and two tables. They’re just not here yet. 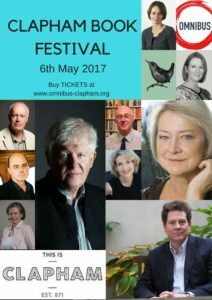 By the time I return to the tent the Clapham Book Festival ‘Common Reading’ banner is up and our writers/performers begin to arrive. Here’s Isabelle,former Clapham resident and crime writer par excellence. Hallo. A little buggy arrives drawing a trailer, on which there are chairs!! But the scientists get to them first. More please, we plead with the buggy driver, and QUICKLY. It’s after half past twelve. But Mitchell’s colleague has arrived and secured the stage. So we can at least set up the mics. Annemarie arrives, another Clapham writer. She, like me, has lived within a couple of miles of the Park for many years and yet has never been to the Show. The buggy is back and we all start unloading and setting up chairs, so that our tent looks as if something is about to happen. It’s a quarter to one and Sabine, the last of the Thriller in the Park panel arrives. One problem – no audience. And he’s right. We begin and they do. We launch into an interesting discussion about writing crime and thriller fiction. Clapham Book Festival at the Lambeth Country Show has begun. Now that this year’s Book Festival is successfully concluded Clapham Writers next outing will be later this month at the Abbeville Fete (30th June) where members of our Management Board will be running the second-hand book stall in the Church of the Holy Spirit. Fete visitors will find copies of the Clapham Literary Trail and more information about the Book Festival available, as well as flyers for the next time authors get together to discuss books. This will be in July at the Lambeth Country Show held in Brockwell Park, South London. Billed as the biggest outdoor family event in Europe with over 150,000 expected to attend across a weekend, this ever popular event includes all the elements of a country show – pony rides, animals (owls are a popular feature, as are birds of prey), competitions for vegetables and flowers, fancy dress, displays of jousting and other equine acrobatics, lots of music, food and activities. Gates open at 12 noon and close at 8 pm and it’s free. One element is the Discovery zone, containing a marquee for various presentations and performances. Last year this included slots by curators of the Natural History Museum, members of the Royal College of Physicians, various musicians and performers, etc. etc. This year Lambeth approached Clapham Writers and have asked us to do two sessions, one on Saturday and one on Sunday. On Sunday at the same time it’s The History Girls, with Professor Kate Williams, Elizabeth Buchan and me. Our ad copy reads – ‘Throughout history women have been silenced and thought weak-minded, puny and sexually incontinent. Come and hear how women novelists of today write about the history that excluded them.’ Having commentated on the royal wedding, historian Kate Williams will be talking about her biographies and her trilogy of novels set during and after the First World War. I will be taking folk back to the drama of Al Andalus as Moor and Christian battle it out and Elizabeth Buchan talks about writing about the SOE and Clapham Common in the aftermath of the Second World War. Wow, that sounds good. Some of our trusty volunteers will be there to staff the book stall, with books ordered and supplied by Herne Hill Books (sister shop of Clapham Books). So it’s full steam ahead for the Lambeth Country Show. Then…. well there’s Quickreads in Brixton Prison ( and on National Prison Radio ) with Vaseem Khan and, we hope, another Quickreads author and, at the start of September, the Clapham Summer Fete (see He Shouldn’t Have Parked There for a blog on last year’s event ). A version of this post appeared on The Story Bazaar blog in June 2018.